After years of helping homeowners and businesses make the most of their yard and landscaping, we've learned a few things. 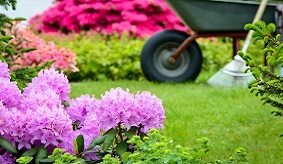 We will be sharing tips here on landscaping, lawn care, gardening, and more. Our goal is to help make your property more beautiful while simplifying your life! During the last few years we have seen an increasing number of our clients taking an interest in growing their own vegetables. And, we applaud that move. Lawn aeration is critical to the growth and health of your lawn. Learn more about this important service and how it will help create a more beautiful, vigorous, and healthy lawn.